Small restaurants have many advantages over larger establishments and national chains. 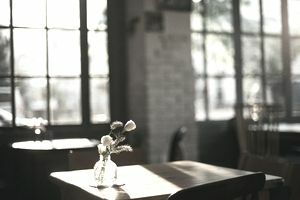 Small restaurants offer instant ambiance and coziness, which are ideal for a concept like a cafe or a sidewalk bistro. They often require less startup capital for equipment, maintain less staff, and cost less in terms of ongoing utilities and maintenance. Even with a small amount of seating, smaller restaurants can still produce sizable profits. No matter what size restaurant you are thinking of opening, location is one of the most important factors (if not the most important factor) to consider. Not every available space is right for a restaurant. A good restaurant location is hard to find. What may look like the perfect spot—say a bustling pedestrian street in the heart of downtown—may turn out to be a dud. Other times a spot that you would never think to put a restaurant—like in an old factory in a former industrial park—is a success. Very small dining rooms, while offering instant coziness, can be somewhat of a puzzle when it comes to fitting in all the necessary pieces. The dining room, no matter what type of concept you are planning, is the heart of your restaurant. A typical restaurant dining room design includes seating, wait stations, and storage. While it may be tempting to cram more seating in your dining room ​than is comfortable, this only results in poor service, making it hard for staff to maneuver between tables and hard for customers to enjoy their meal. The rule of thumb with setting up restaurant tables is that each table should be between 24 and 30 inches apart. You may want to consider restaurants booths as a space saving option in your dining room. Just like restaurant chairs, booths come in a variety of shapes, sizes, and colors. Flexibility is also important when planning a smaller dining space. Allow tables to be moved together for larger parties or broken apart for smaller parties. No matter how the tables are arranged in your restaurant dining room, it is important that there is a clear path in and out of the dining room, for staff and customers. Read more about planning a restaurant dining room. No matter if it is a small cafe or a sprawling eatery/conference center, you will need a business plan to secure any kind of financing. Think of your business plan like a roadmap to success. It will lay out important items like your startup budget, expected profits and losses, payroll, and other operating expenses. As you research information for your restaurant business plan, you may encounter issues you hadn’t considered previously, such as licensing, health codes, and tax laws. Pay careful attention to the type of menu and the dishes that you plan to serve. The trend toward local produce and farm-to-table is well-suited for a smaller establishment, which can highlight regional cuisine and ingredients sourced from the community or surrounding area. High turnover and high check averages mean higher profits, even for small restaurants. Therefore it is important that you promote your small restaurant. There are many ways to market your restaurant, from traditional advertising like local papers and radio spots to newer mediums like social marketing. A social media marketing campaign can help restaurants woo new customers, let you check out the local competition, and think of new ways to reach customers through sites like Facebook, Twitter, and Pinterest. Successful restaurants don't have to be huge. Some of the most popular restaurants in the world are housed in small, intimate spaces. While small restaurants come with their own set of challenges, they offer a unique dining experience and sense of exclusivity that appeal to customers.